Let me show you the finished product first! I am doing a polka dot theme in my class this year. I bought some colorful polka dot scrapbook paper and made little squares labels on the computer. It actually took a long time to make sure the size of the print, box, and polka dot paper looked right on each drawer. I don't know of a quicker way besides printing off the little drawer labels and testing out the size. Once I printed, glued, and laminated the drawer labels, I laid them out to see where each one would go on the box. Then I velcroed each label to the outside of the drawer. I have seen most people place the labels on the inside of the drawer, but I wanted them to be velcroed so I could change them out if I need something different in the drawers. Close up of the small drawers. 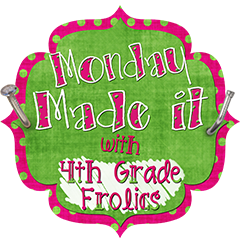 Head over to 4th Grade Frolics to see what everyone made for Made it Monday! Love it! I also like the ides of velcro-ing the labels on so you can change them! :-) Looks like a fun teacher afternoon!!!! I love the colors! It turned out great. Those look fabulous and it looks like you had so much fun!!!!! I'm jealous!!!! I wish I had time to do stuff like that! I have so been on the fence about these teacher tool boxes because they look like so much work, but the sheer cuteness of your might have pushed me over the edge! Hmm, who can I talk into making one of these with me? How big is it? Come enter my poster printing giveaway! They look FANTASTIC! Love the colors! I love the polka dots!!! You guys did great! I love the tool boxes. They did great! Love it!! Wish we could have a crafting date! How fun to make these with a buddy! I think they are both adorable! I made one for the teacher I shared a room with at the end of the school year. I have one, but I never made it as cute. I hope to do that before school starts! I like the big drawers too, but mine is like yours Michelle. Mine is used by the parent volunteers. These look awesome. I think I need to recruit a buddy for next week to help me with making one of these. I have already spray painted one black, but just need to get motivated to add the scrapbook paper. I love my teacher toolbox! I can't wait to fill it up when I can finally get into my room. I'm a new follower. Thanks for stopping by my blog!! I think I have to make one of these finally! I like the blue one but I love how the white one looks.